As Western armies contemplate a future role for the Main Battle Tank (MBT) amidst changing operational priorities and limited budgets, Russia has demonstrated clear commitment to a new generation of tank: the Armata T-14. Although frequently speculated on, the full operational capabilities of this new battle tank remain unproven, but a revolutionary design with the integration of new technologies are a potential challenge to current Western capabilities. According to The Military Balance 2016, published by the International Institute for Strategic Studies, Russia maintains an active force of around 3,000 battle tanks, numerically similar to the United States, although theoretically reinforced by larger reserves of more than 17,000. Successive Russian initiatives to modernise its sizeable active inventory of ageing Soviet legacy systems have been hampered by financial constraints. 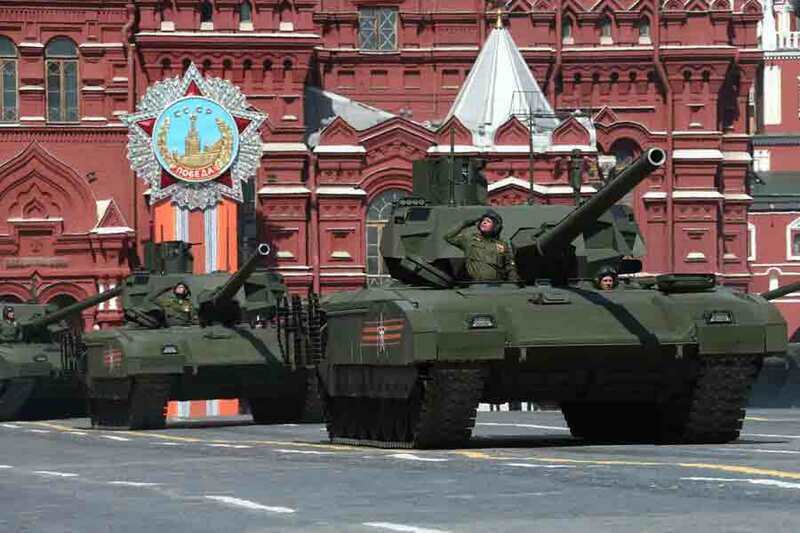 The first public appearance of the Armata T-14 at the 2015 Moscow Victory Day Parade came midway through a more extensive state rearmament programme with an ambitious initial goal of ensuring 70% of all military equipment is ‘modern’ by 2020. For Russian ground forces this includes the planned introduction of several new platforms forming the mainstay of future armoured forces. One of these is the Armata—a universal, heavily armoured platform, which provides the basis for a range of combat and combat support variants, including the T-15 heavy Infantry Fighting Vehicle (IFV) and T-16 Armoured Recovery Vehicle (ARV). The Armata T-14 is the principle MBT variant, signifying Russia’s first all-new tank design since the introduction of the Soviet T-80 some 40 years ago. For much of the intervening period, Russia focused primarily on updates of the earlier T-72 family, inclusive of T-90 derivatives, which provided incremental armour and capability improvements to the family, but their development was limited by the base design. The overall design of the T-14, however, places greater emphasis on crew protection and survivability than earlier generations. Whilst the development and proliferation of advanced anti-tank weapons are a driver, the Russian Army’s transition towards a smaller, more professional—less conscripted—force places greater value on individual tanks and crews. Higher protection levels, coupled with provision for a planned firepower upgrade, have resulted in a notably larger vehicle than its Soviet predecessors, although one now comparable in size to Western counterparts. The weight of the vehicle is managed by the reported development of lighter armour and the introduction of an uncrewed turret. The uncrewed turret is the most revolutionary aspect of the T-14 and it is expected to be the first operational battle tank to have this feature. Russia and others, including Germany and the United States, previously evaluated, but did not progress the concept beyond prototype demonstrators. Russia’s decision in the 1960s to adopt an autoloader system in the T-64 and subsequent tank designs—contrary to wider Western conventions—already made a human loader redundant. Subsequent advances in remote sensing removed the prerequisite for any crew within the turret. This design had clear advantages for the protection and survivability of the three remaining crew, now stationed together within the armoured front chassis. Removed from the turret, one of the most exposed and targeted areas of a tank, the crew were also better isolated from onboard combustible materials—a well-documented vulnerability of previous designs. The removal of turret crew space reduces the area requiring armoured protection, allowing for weight savings or redistribution. Although the turret of the T-14 remains large, the outer shell housing sub-systems is only lightly protected with an inner concentration of heavy armour protecting the main gun and autoloader. For opponents, this presents a smaller, more challenging target, with even a successful turret penetration less likely to incapacitate crew or their ability to withdraw. The exact types and levels of armour protection employed throughout the T-14 will remain a closely guarded secret. However, a new lighter type of armour has been reported along with a new Malachit Explosive Reactive Armour (ERA), which is designed to counteract impacting projectiles with an explosive force. In addition, there is apparent recognition of increasingly unconventional asymmetric threats, including removable modular applique armour applied to the side skirts, which—like several Western equivalents—could be changeable in composition to meet different threat environments. Western style bar armour is also employed to protect the engine area against the threat of Rocket-Propelled Grenades. The increasing diversity and sophistication of incoming threats beyond the traditional heavily armoured frontal arc, presents a key challenge for future tank design. The traditional reliance on adding armour imposes a significant weight and thus mobility penalty. The introduction of an Active Protection System (APS) to detect and degrade some types of incoming projectile threat before impact can, however, reduce dependence on passive armour. Although the concept is not new, with Russia pioneering its development—APS are increasingly being evaluated as the technology and application matures, although costs remain prohibitive. The combat effectiveness of the Israeli Trophy system has also renewed interest in APS employing hard-kill countermeasures—those that physically counterattack threat projectiles to neutralise or reduce their effectiveness. Although theoretically able to prosecute a variety of guided and unguided projectiles, primarily RPGs and Anti-Tank Guided Weapons (ATGWs), APS’s application against tank-fired rounds, including kinetic penetrators, is thought to be limited. The Armata T-14 integrates the newly developed Afganit APS to the turret to provide an additional layer of protection. The system utilises radars to identify and track incoming projectiles in order to deploy countermeasures. Fixed forward facing launchers at the base of the turret are assessed as likely hard-kill countermeasures, similar to the early Soviet Drozd system—the world’s first operational hard-kill APS—suggesting use of a counter projectile detonating in close proximity to disrupt the first. Two smaller sets of traversable launchers and an additional fixed vertical launcher are also widely associated with Afganit, but may represent a range of soft-kill countermeasures launched to disrupt the targeting systems of guided munitions, specifically ATGWs. Although the potential hard-kill coverage of the configuration may be limited—protecting only the frontal arc relative to the turret position—it could represent a cost-effective solution for wider-scale deployment of APS, whilst still posing a particular challenge to the current anti-tank capabilities of opposing infantry. In respect of firepower, the current prototypes mount the latest version of the proven 125 mm smoothbore cannon, however it is the stated intention to upgrade to 152 mm, which would be the largest calibre gun ever mounted on an operational post-war MBT. Likely part of the original plan, as evidenced in the turret height and inclusion within the aborted precursor Object 195 design, the integration of the 152 mm cannon may have been delayed on developmental or potential cost grounds. Although the precise armour-penetrating properties of this future main gun and accompanying round types are unconfirmed, the sheer kinetic energy increase associated with this larger calibre weapon presents a challenge to even the latest Western armour. In addition, whilst the current 125 mm cannon will reportedly support the firing of new ATGWs, an increased calibre could facilitate the development of larger and more capable barrel-fired guided munitions. The protection levels and projected firepower of the T-14 are significant, but its success on the battlefield will be determined by the crew’s ability to utilise these new capabilities to best effect, within a tactical formation and a wider combined arms force. Whilst advanced sights, sensors and fire-control systems are no doubt employed, the APS may also have an important situational awareness role. Its tracking of incoming threats may also enable its use as a counter-fire radar, as per the Trophy system, enabling accurate return fire and potentially provide enemy locations to other nearby friendly forces. Crew stations are also highly digitised in terms of interface and control providing multiple information feeds on crew screens. Having removed the crew from the turret, the T-14’s manufacturer, Uralvagonzavod, also envisions a potential future unmanned ground vehicle variant. Given an already digital interface and reliance on remote sensing, this could be a surprisingly easy transition for future crews. For Russia, the Armata T-14 represents a significant and overdue capability update for its tank forces. The key challenge will be avoiding past failures to secure ongoing financial support to procure the type in meaningful numbers. Although the current rearmament programme has made strong progress, its sustainability within a troubled economy is uncertain and may prompt reassessment of priorities or curtailing of some individual programmes. 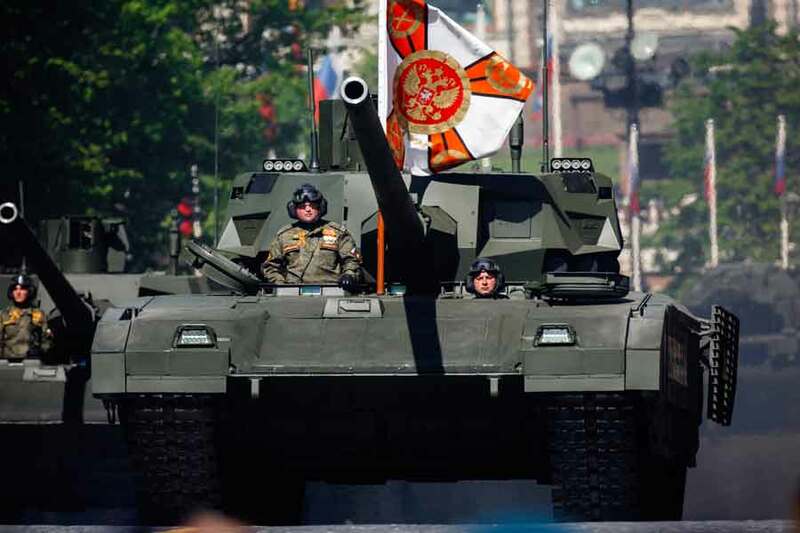 A requirement for 2,300 Armata T-14 battle tanks by 2020 is widely circulated, although it remains questionable in terms of both accuracy and ambition. The T-14 programme is, however, advancing, with the evaluation of around 20 prototypes leading to an initial order of 100 scheduled for delivery in 2017, which indicates the commencement of at least low-rate serial production. Whilst the Army awaits Armata, it nevertheless continues to procure upgraded T-72B3s—more than 600 over the last few years. A probable stop-gap for the longer-term introduction of the T-14, it may also serve as a safety net should ambitions fall short. It also suggests that Russia will continue to operate and be forced to maintain a mixed battle tank fleet for decades to come. There are conflicting reports about the unit cost of the T-14. Whilst the cost of the prototypes was reportedly unsustainably high, these will no doubt steadily reduce with serial production. The majority of unit costs are reportedly not attributed to the basic platform, but the advanced systems integrated within, such as the fire control system or the APS, indicating potential scope for budget management within the build. Tanks rolling off future production lines may not necessarily replicate the ‘gold-plated’ specification and capabilities portrayed by paraded prototypes. Subsequent orders for other Armata platform variants could also drive down costs due to commonality of components and subsystems. The massive potential for export orders, post 2020, could also secure a longer and more efficient production line with China already believed to have expressed an interest. If Russia’s ambitions for the T-14 are indeed realised, both in terms of capability and procurement, it poses a challenge to current Western capabilities. It presents a stepped—as opposed to incremental — increase in opposing MBT capability, and one that the West has needed to address for some time. As a consequence, enhancement of battle tanks and wider anti-tank capabilities have diminished in priority, with forces naturally focusing on adapting to the more pressing unconventional and asymmetric threats of current operating environments. Concerns about the T-14, however, represent wider Western apprehension about a resurgent Russia and the west’s ability to counter a modernised military force in a direct conventional conflict. However, the West’s first challenging encounter with Russia’s next generation MBT—like its Soviet predecessors—is perhaps more likely to be with an export variant in foreign service. The historic prominence of Russian tank design and position within the global market means the T-14 may not only be widely exported, but also influence wider industry change and provide an indicator of future MBT evolution. Uncrewed turrets, the wider application of APS, and potential increases in calibre, may all feature more prominently in future designs, both to follow and to counter these potentially emergent trends. The T-14 may also prompt the wider Western adoption of the autoloader— a prerequisite for an uncrewed turret, but also required to handle larger calibre munitions. New developments may also reinvigorate the continuous development cycle of improving both armour protection and penetration, which has followed the tank through its 100-year history. Improvements in anti-tank weapon capabilities, specifically ATGWs, have continued to challenge the justification for the MBT. However, wider fielding of APS could signify their reduced effectiveness, reappraising the requirement for the direct-fire, anti-armour guns of the tank. Indeed, the best answer to the problem of a new tank may remain another tank, and whilst the T-14 may threaten current Western capabilities, its design features also provide clear direction in which to follow and the opportunity for countries to develop their own next-generation MBT. Joseph Dempsey is a research analyst within the Defence & Military Analysis Programme at the International Institute for Strategic Studies. He holds a BA (Hons) in International Relations & Global Politics from Nottingham Trent University and an MA in Defence & Security Analysis from Lancaster University. Before joining the IISS, Joseph worked as a counter-terrorism intelligence analyst for the Metropolitan Police Service.